Across the globe, there is a great deal of consensus on how the news media should report on political issues. Large majorities in nearly every country surveyed say that their news media should always be unbiased in their coverage. At the same time, while people are generally satisfied with their news media’s performance, publics around the globe give the lowest ratings for reporting on different political positions fairly. In contrast, they largely approve of the job their news media are doing covering the most important stories of the day, providing accurate news and covering government leaders and officials. Within a majority of countries, satisfaction differs based on one’s political orientation; people who support the governing political party tend to be more satisfied with their news media than those who do not. Despite differences in news media and political structures, clear majorities in 35 of the 38 nations surveyed agree that it is never acceptable for a news organization to favor one political party over others when reporting the news. Globally, a median of three-quarters (75%) say such media bias is never permissible, compared with 20% who say it is sometimes acceptable. The one country where more say it is sometimes acceptable than never acceptable for a news organization to favor one political party is India. Among adults there, 41% say it is acceptable for news organizations to, at times, favor one political party, compared with 25% who say it is never acceptable. A third of Indians express no opinion on the matter. Israel and the Philippines also stand as relative exceptions to the strong global consensus. In both of these countries, about four-in-ten say it is acceptable for news organizations to sometimes favor one political party over others. Within some countries, there are education differences on this measure. In 11 of the 38 countries, people with higher levels of education are significantly more likely than those with less education to say that media bias is never acceptable.1 These gaps are largest in several Latin America nations, with differences of more than 20 percentage points in Mexico, Colombia and Brazil. 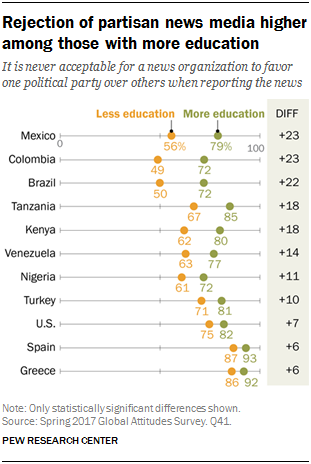 For example, in Mexico, 79% of people with at least a secondary education think media bias is never acceptable, compared with 56% of those with less education. Respondents were asked to evaluate their news media on four different measures: covering important issues, providing accurate news, covering government officials, and reporting the different positions on political issues fairly. For all four, the global medians tend to be more positive than negative, but overall views vary across performance area. Reporting on the most important news events garnered the highest rating overall, with a global median of 73% saying their news media do very or somewhat well in this area. The degree of satisfaction differs somewhat by region, from a high of 82% in sub-Saharan Africa to a low of 59% in Latin America. And in most countries, far more express moderate satisfaction than strong satisfaction. A global median of just 26% say their news media are doing very well on reporting on the most important news events. Only in sub-Saharan Africa do more than half say this. There are only two countries in which majorities say their news media are not doing a good job reporting on the most important news events: Greece (57%) and South Korea (55%). CORRECTION (Feb. 2018): Due to a typographical error, a previous version of the chart “Most say news media do good job covering most important stories,” gave an incorrect “Total well” percentage for South Korea. The correct number is 44%. This correction does not materially change the analysis of the report. Publics also largely agree that news organizations are doing a good job at reporting the news accurately. A global median of 62% say they do very or somewhat well on this measure, with at least half in 29 of the 38 countries expressing this sentiment. Once again, however, the highest levels of approval are sparse; a global median of only 18% say their news media are doing very well on reporting news accurately. Regionally, ratings of the news media on providing accurate facts are highest in the Asia-Pacific (median of 80% well) and sub-Saharan Africa (75%), and lowest in Latin America (51%). Greece and South Korea again stand out as countries in which majorities think that their news media are not doing a good job on this item (78% and 62% respectively), though majorities in Colombia and Chile also express disapproval. Global ratings of the media’s performance for reporting on government officials and leaders are slightly lower than evaluations of their ability to report on the most important stories and accuracy. Still, a global median of 59% say their news media are doing well on this dimension. Positive evaluations are highest in sub-Saharan Africa (median of 73%) and the Asia-Pacific (72%) and more mixed in Europe (52%) and the Middle East (52%). In Latin America, fewer than half (43%) say their news media are doing a good job reporting on government officials and leaders. Within Latin America, disapproval is highest in Chile (61%), Argentina (57%) and Peru (55%) – though, outside of the region, Greece (72%) and South Korea (72%) once again stand out. Among the four issues tested, evaluations are most negative when it comes to whether news organizations are doing a good job at reporting different positions on political issues fairly. Globally, a median of only about half (52%) think their news media are performing well in this domain. Regionally, medians of less than half approve in the Middle East (46%), Europe (45%) and Latin America (42%). Still, majorities in sub-Saharan Africa (69%) and the Asia-Pacific (65%) praise their media’s performance. Looking country to country, dissatisfaction continues to be highest in Greece (80%) and South Korea (72%). But disapproval of the media’s performance on this topic is more widespread; across 14 countries, roughly half or more say new organizations are not doing well on this key role. In the U.S., for example, 52% think their news media are doing a poor job reporting different positions on political issues fairly, compared with 47% who say they are doing well. In 22 of the 38 countries surveyed, those who say that it is never acceptable for the media to favor one political party over others when reporting the news are also more likely to think the media are doing poorly with regard to reporting on different political positions fairly. The gap is largest in the United States. Among Americans who think it is never acceptable for news organizations to favor one political party over another, roughly six-in-ten (57%) say their media are doing a poor job reporting fairly on politics. In contrast, among Americans who say it is sometimes acceptable for news organizations to favor one political party, only about one-third (31%) rate their media negatively – a 26-point gap. To examine how the public’s satisfaction with the news media varies within countries, researchers constructed an index. Respondents are classified as “satisfied” if they say news organizations are doing very or somewhat well on at least three of the four issues they were asked about. Everyone else is categorized as dissatisfied. An individual’s political orientation tends to be one of the strongest factors underlying attitudes about the news media, more so than age, education or gender. In 21 countries, how people feel about their news media is linked to support for the governing party (for more on this measure of political orientation that can be applied across all countries, see Appendix B). In most cases, those who identify with the party in charge tend to be more sanguine about the news media. The gap is particularly large across Europe. For example, in Hungary, supporters of Fidesz and coalition partners the Christian Democratic People’s Party are 20 percentage points more likely to be satisfied news consumers than nonsupporters. In the United States and Israel, however, supporters of the governing party are significantly more likely to be dissatisfied with the media. The gap is largest in the U.S., where 24% of Republicans are mostly satisfied news consumers, compared with 58% of people who do not identify with the Republican Party, a 34-point difference. Since the governing parties in power across these countries vary in their ideological leanings, the gaps found on media satisfaction based on support for the party in power show that there is not a particular ideological position that is consistently tied to satisfaction. Instead, the general relationship between partisanship and news media satisfaction appears to be more about people who are satisfied with the party in power. Satisfaction with the news media also aligns with two key attitudes about country conditions. The first is whether respondents trust the national government to do what is right for the country. The relationship here is strong at the country level. For example, satisfaction with the news media is highest in the nations surveyed in sub-Saharan Africa and lowest in Latin America – areas with relatively high and low levels of governmental satisfaction, respectively. 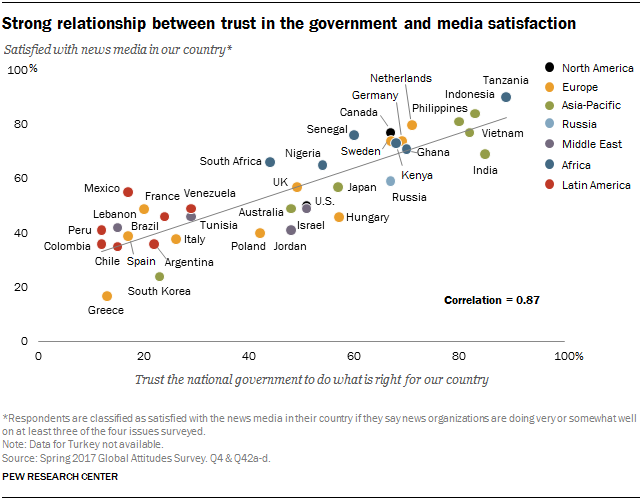 Trust in government is also related to media satisfaction at the individual level. Within many countries, people who express confidence in the national government are more likely to be satisfied with the news media than those who are less confident. The gap is largest in Vietnam, Sweden and the United Kingdom. In the United States, there is no difference in media satisfaction between those who trust the government and those who do not (for more on trust in government, see “Globally, Broad Support for Representative and Direct Democracy”). A second way to measure attitudes about country conditions is by individuals’ opinions about the national economy. Similar to trust in government, the survey finds that in 28 countries people who say the economy is doing well also tend to be more satisfied with their news media.